Are you interested in purchasing pre-made Hudson Bay Bread? You can now buy it online from Northern Tier's Trading Post here. Take home the taste of the trail! This pre-made, great tasting bar is packed with ingredients to give you lots of energy. 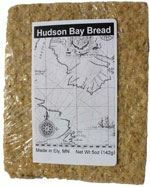 Download the Hudson Bay Bread Recipe card here (PDF). This is a recipe for what the Sommers Canoe Base calls Hudson Bay Bread, or sometimes just Bay Bread. In the 1960's, the Base got the recipe from the Minnesota Outward Bound School, and for several years it was baked at the Barbara Ann Bakery in Ely. At the bakery, it was baked in a convection oven, so it is difficult to get exactly the same effect in a conventional oven. This recipe comes very close. 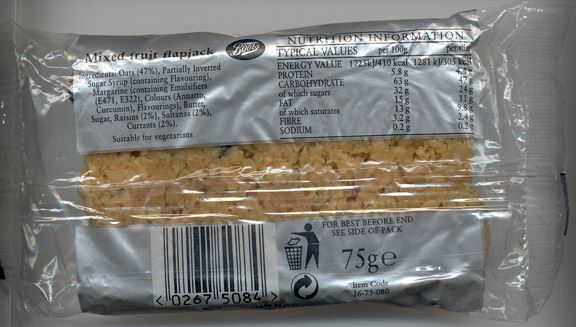 One important technique left out of the Base's official instructions is that rolled oats should be used (not instant oats), and more importantly, they should be ground up. A blender works fine for about a cup at a time, and a food processor would probably work even better. Bay Bread is most excellent as lunchtime fare on canoe trips when you are burning thousands of calories each day. It is convenient, easy to pack, and is a concentrated food source that everyone seems to look forward to on the trail. When you see the ingredients, you will see why it does NOT make a very good "light snack" at home. Press into cake pan or large sheet pan about 1/4 to 1/2 inch thick. Bake at 325 degrees for about 20 minutes. Do not overcook, as it will get crispy and brittle. Take out of oven and use spatula to press down (keeps it from crumbling). Cut into exactly 3 1/2 inch squares. Package in plastic bags with as many as there are crew members (one each for lunch). If you measured correctly, they should just fit into 1/2 gallon paper milk cartons. They will be protected, easy to pack, and easy to find when you want to grab a quick lunch. Slather with massive quantities of peanut butter and jelly, and wash it down with some Red-Eye, and you will know you ate lunch! The above is a very slightly embellished version of the Canoe Base recipe, as provided by Craig Pendergraft and Dave Greenlee. Below Chuck Rose offers some other variations. Cream all ingredients except oats/nuts. Then add oats/nuts and mix well. Spread into 2 greased cookie sheets about 1/2 inch thich Bake at 360 degrees for about 8 minutes. The mixture puffs up while baking. Roll it down with a rolling pin and bake again until golden brown (about 8 more minutes). Roll down again or it will crumble. Don't overbake. Cut while warm, leave in pans to cool. I prefer the vanilla version. The "Hudson Bay Bread" article was great. I don't know if I have ever told you this story or not. It is what I will call the "rest of the story". Hudson Bay bread did come to us via Floyd Lindval (sp?) of the old Barbara Ann Bakery in Ely. Floyd told me that Outward Bound had gotten the recipe from their headquarters in Europe. This was about 1967 or 68, Outward Bound had just gotten started, I believe in either 1964 or 65. Sorry I can't remember their first year. The story that was told to Floyd was that it was a version of a high energy bar carried by Edmund Hillary (circa 1953) when he successfully climbed Mt. Everest. It was supposedly made by a woman in England (evidentially much of his provisioning was done in England). This recipe is a takeoff on a popular oatmeal bar called a "flap jack" in England. I have talked to many that recognize "flap jacks", they are usually cut like small cookies (biscuits of course to our English friends). It was modified to be as complete a "ration" as possible with several types of sugar (carbohydrates), fat and proteins. The several sugars were supposed to be absorbed at different rates giving a longer heat and energy level (this may or may not be true, but makes a good part of the story anyways). Floyd added the "all American" flavor of Mapleine. He thought it was going to be a hit, brought it out to me and said he was going to call them "Flap Jacks". We gave them a try -- instant success!! Sitting in the old office (formerly the trading post) of the "Bay Post" one afternoon several guides were telling me how the Scouts liked the "Flap Jacks" but the name seemed a little wrong since we call pancakes flapjacks. I agreed -- I said, rather flippantly as I recall, we will just call it "Hudson Bay Bread". The name stuck and many others started to use it. Everyone of course had their own version; peanuts instead of almonds, then walnuts. Northern Wisconsin even added raisins at one time -- everyone wanted to take credit for developing it but now you know the "rest of the story" -- It came to us from Outward Bound via Floyd at the bakery but was named looking out over Moose Lake from the "trail staff" office of OUR Bay Post!! The first time I saw it in print was the book by Ragsdale, a former Advisor from Texas. I have now seen it in so many cookbooks I couldn't begin to tell you the number. Originally our version was oatmeal, fats (mostly margarines), almonds and Floyd's magic touch of Mapleine. Hudson Bay Bread - What's in it? Anybody can look at the ingredients in the recipe and see that bay bread is full of nutrients that help satisfy the kind of hunger you can only get while paddling and portaging all day long. Thanks to some detective work, now we can share a good bit more about the nutrition information. Recently my daughter Meghan went to England and made a discovery. She had heard the story that Sandy Bridges told us about the origination of the recipe and its roots as an English snack called "flapjacks". Imagine her surprise when she saw some bay bread packaged in cellephane on the shelf of a convenience store. 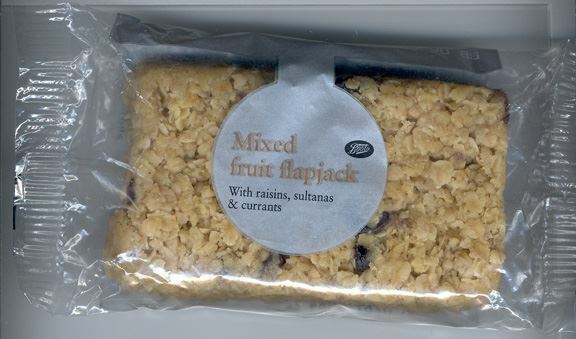 There were several kinds, but the one that looked most like bay bread was called "Mixed fruit flapjack". She dutifully bought one and dragged it home so that I could see her discovery. On the front of the package, it says: "with raisins, sultanas, and currents". Since I didn't know what a sultana was, I checked the Internet and found out that in the U.K., a sultana is a dried Thompson Seedess grape, a "special" kind of raisin. Also, it certainly looks just like bay bread, except that the portion is about half the size of our typical 3 1/2" (just fits in a milk carton) size. Energy Value 1725kJ / 410kcal. 2562kJ / 610 kcal. Look at the carbohydrate! It sure isn't going to make it for the Atkins Diet. On the other hand, you can begin to see better why we look forward to it on the trail. Keep in mind that these numbers are BEFORE you put the peanut butter and jelly on.